Growing your own food to use in delicious simple recipes should be something anyone can do. For those with smaller gardens, courtyards, balconies or even just a window sill, containers offer a way to grow most crops, or at least some lovely fresh herbs – in fact, sometimes pots can even be preferable (if your garden soil is full of rocks for example). Here you’ll discover everything there is to know about garden containers. You can be forgiven for thinking your choices are limited to plastic or terracotta but, as you’ll discover, there are many types of container available, some of which you might already have at home! You can grow plants in virtually anything that holds soil and has holes in the bottom for drainage. Your only limit is your imagination and it’s a great excuse for some creative recycling! Plastic pots are readily available, cheap to buy and a popular choice. They are lightweight, making them easy to move around and are perfect if you don’t want to spend a lot of money on gardening. You can buy them in a variety of sizes and will find square, rectangular, round as well as other shapes. 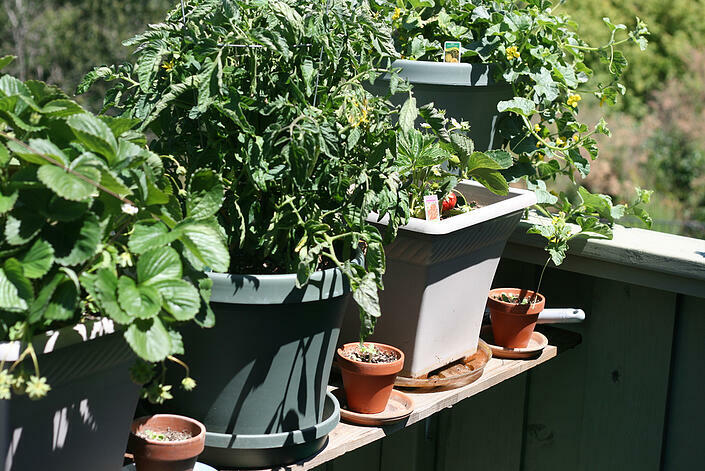 This means you can fit pots with straight sides into corners of your patio, balcony or roof garden. Plastic pots are strong and flexible despite their light weight. They are available in all sorts of colours to blend into the background or make a statement! Plastic pots are great for moisture-loving plants as they retain water well and do not wick it away like some materials. Plastic is an inert material suitable for growing edible plants. Cheap to buy and easy to find. Lots of different sizes, shape and colours available. Retain water well – good for gardeners who forget to water! And perfect for moisture-loving plants. Inert material means it is safe for food. Plastic pots have their downfalls too. Despite being cheap they are not very environmentally friendly unless made from recycled plastic. Once they are no longer wanted they are difficult to recycle in some areas so can end up in landfill. As the plastic is quite thin, these containers offer little by way of insulation which means summer sun can heat up the contents to damaging levels. During the winter, temperature drops can destroy plants. Plastic is prone to UV damage and can become brittle or discoloured very quickly. Dark-coloured pots such as black or dark green can absorb so much heat from the sun in the height of summer that the soil heats up and destroys the plant roots. Even though they are better for gardeners who forget to water occasionally, they can keep soil too wet when over watered which leads to rotting roots. Difficult to recycle in some areas. Offer little insulation to soil and plants. Can suffer from UV damage and become brittle. Can fade and become unsightly. Easy to waterlog plants and rot the roots. Many window boxes are now made from PVC, which makes them very stable. Due to their popularity, prices are coming down all the time, making PVC one of the cheaper options. Does not crack or warp. Can be painted to look like wood. Along with the numerous advantages of PVC, there are some disadvantages too. PVC is made from non-renewable resources and is difficult to recycle, so it’s not the ideal material for end disposal. PVC is made from non-renewable resources. PVC is difficult to recycle. Insulation is not good, so soil can get too hot in summer or too cold in winter. Fibreglass (glass-reinforced plastic) is also a good option and ideal for use both inside and out. They can be painted or can be bought in a style that looks like stone. Fibreglass boxes will last a lifetime. Although it has many good points, fibreglass is a brittle material, so if it is knocked or dropped it can chip or even crack. It is also a very thin material with poor insulation properties. This is fine if your climate is fairly stable throughout the year, but if you experience very hot summers or harsh winters it might not be the best material to use. As fibreglass is so hard wearing, it is also expensive. Brittle – may crack or chip if dropped. Poor insulation – compost can freeze in winter and overheat in summer. Expensive as it is so hard wearing. The UK uses over 5 million tonnes of plastic each year of which an estimated 19 per cent is currently being recovered or recycled. Terracotta pots are readily available in garden centres and are very popular. The material is durable and attractive. They are quite heavy which makes them ideal for exposed areas; there is no risk of them blowing over in the wind, even with tall crops in them. You can buy terracotta containers in many different shapes and sizes to fit into your space. Terracotta pots are sturdy and if looked after can last many years. Unglazed pots are available in the traditional terracotta colour but you can buy glazed ones in all colours of the rainbow. Terracotta pots wick away moisture from the plants which means risk of over watering is reduced. 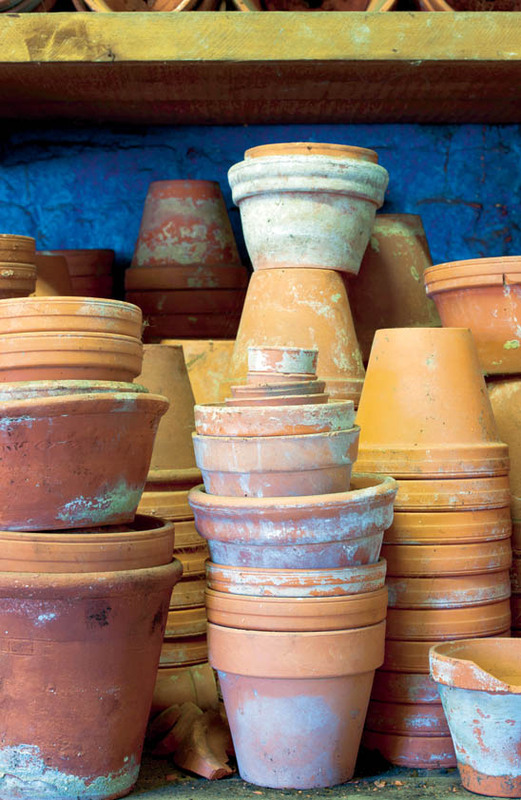 Terracotta is easily recycled after use and is safe for growing food crops. Readily available in garden centres. Moisture-wicking – good for gardeners who tend to over water. The most obvious downside to terracotta pots is that they break easily if dropped or knocked. Some cheaper pots crack in the frost because water gets into the material, freezes and expands. Glazed pots can stop this happening. Terracotta pots can take much needed moisture from some plants and so require more watering, but this is not an issue with glazed pots. If you’re the sort of gardener who leaves plants to wilt before watering, clay pots are not the best choice. Clay pots can remove too much moisture from seedlings so it might be better to transplant into plastic pots if you’re worried about keeping the soil moist enough. Terracotta pots have the habit of forming a white layer on the outside from water deposits that some gardeners find unsightly. In addition, clay pots are much more expensive than plastic ones. Cheaper pots can crack in the frost. Can remove too much water for gardeners who tend to under water. Can look unsightly when white deposits form on the outside. Much more expensive than plastic pots. Other pots that are great for the environment are biodegradable pots. These can be made from coir, wood fibre, latex, rice husk, recycled paper, textile fibres or cardboard. The beauty of these is there is no landfill waste. They are surprisingly hard wearing; while some are designed for seedlings, planted into the ground and then rot away, other biodegradable pots last for up to two seasons. Coir fibres are separated from the coconut husks and tossed in a ‘drum’ to separate the coir granules from the fibres. The fibres are then washed in fresh water, dried in the sun and formed into pot shapes. When the pots are dry, they are dipped in latex and then trimmed, inspected and packed. The main advantage to using biodegradable pots is environmental. Whereas plastic is made from oil, a non-renewable resource (which needs refining, and chemicals to produce the pots), biodegradable pots are made from constantly renewed, natural resources. As many are plant-based, this has the added bonus of the plants themselves reducing CO2 emissions. Finally, these pots biodegrade, so the natural resource returns to the soil – just as nature intended! Lightweight and will not break when dropped. Keep roots moist and warm. Made from renewable sources and do not contribute to landfill. The disadvantages to using biodegradable pots are mainly associated with cost and availability. It’s much quicker and easier to source plastic or terracotta containers and you need to remember to replace biodegradable pots, so there is an ongoing cost. More expensive than plastic pots. Need to remember to have more pots in stock for when these biodegrade. Not all pots are made equal; some use glues so are not biodegradable at all. 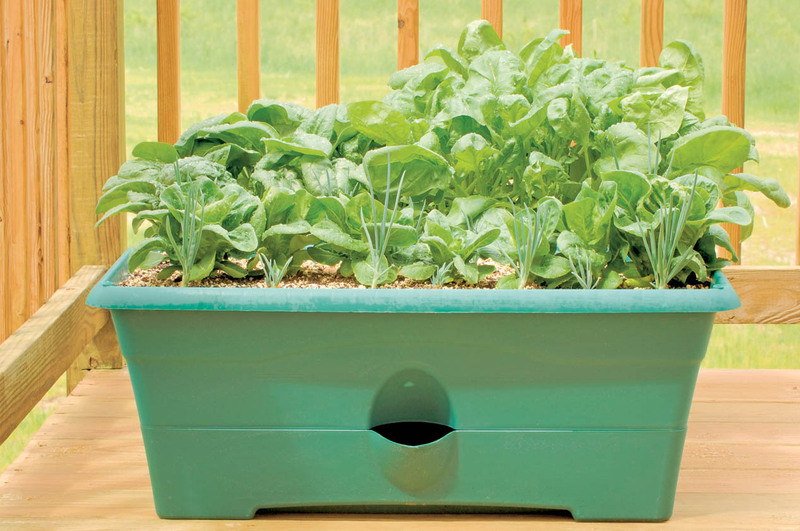 Finding suitable containers to grow food in doesn’t have to cost anything at all. If you take a look around your home, shed, garage, basement or attic you’ll find all sorts of things that are perfect. As long as the container is deep enough and big enough you can grow many different crops from small clumps of chives to potatoes. Raised beds are ideal if you have a decent-sized patio to build them on. You can buy pre-made beds which you slot together or you can make your own from a variety of materials. Raised-bed gardening is very popular, even for people who have large gardens, as there are several advantages to them over an open plot – for example, you can control the environment of the raised bed, weeding is much easier and you can extend the growing season. Raised beds are basically large boxes of compost. They are usually 1–1.2 m (3–4 ft) wide and any length to suit the size of your plot. You can make them anything from 30 cm (12 in) deep to waist high, which is perfect for people who find it hard to bend or kneel. Raised beds lend themselves to permaculture principles because you tend to pack plants in more densely to create a micro-climate where moisture is conserved and weeds are suppressed by plant growth. Raised beds are usually made from wood. You need to choose the source carefully and ensure it hasn’t been treated with anything that could leach into the soil and contaminate your food. Other materials are concrete blocks, which are cheaper but not as nice to look at, or polyurethane. Ability to control the soil quality. Crops are planted closer together resulting in natural weed suppression and moisture control. Can be built to any height, making them ideal for people with physical limitations. Ideal if you want to try permaculture or square foot gardening. Raised beds can be one of the more expensive options. The containers are quite large and by the time you’ve bought compost to fill them (and don’t forget it will need to be replenished every two or three years) the ongoing cost can be significant. Raised beds are heavy, so not suitable for some plots such as balconies. Can be expensive to buy if you’re not able to make your own. Filling with compost can be costly as they’re usually quite big. Impossible to move once filled. Not suitable where weight limit is an issue e.g. balcony or roof garden. Window boxes are rectangular containers usually supported by brackets and situated outside your windows. They are traditionally used for flowers, but can be used for herbs and other edible plants. Window boxes are usually made out of wood or plastic, but you can buy them in fibreglass and metal as well as other materials. They range from rustic looking to ornate and fancy ironwork. Window boxes are the containers that come in the biggest variety of materials. Window boxes are ideal for people who live in high-rise housing or have little or no outside land. They are usually around 15–20 cm (6–8 in) deep so are only suitable for certain plants. As they are outside windows you would not grow tall plants in them otherwise this would obscure your view and the plant would be unsteady with such little depth to the container. Window boxes are maintained by opening the window and reaching out! Just be aware of people walking underneath when you tend or water your boxes. They are ideal for putting outside your kitchen window, especially for herbs or salads where you can lean out and snip the leaves from whatever plant you want to eat. They can also be used indoors if you have deep enough windowsills. 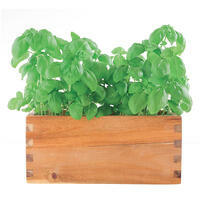 Self-watering window boxes can help if you are a gardening novice or you are often away from home. Automatic watering systems allow you to go up to three months without worrying about keeping the soil in your plants moist! These are particularly helpful indoors when the temperature can fluctuate at different times of the year. Wrought iron, which is mainly used for window boxes, offers distinctive styling. Often called ‘window baskets’ or ‘hayracks’, these types of baskets are lined with coir (coconut husks) to retain your plants and soil. The quality of the finish will determine how long the ironwork remains looking good. The main disadvantage is that it will eventually rust. While this might look ‘antique’ for a while it will gradually erode and deteriorate, which could make it unsafe. Wrought iron is heavy and requires strong fixings to your home. Usually only available in black. Once it rusts it slowly deteriorates. Aluminium is very low maintenance. 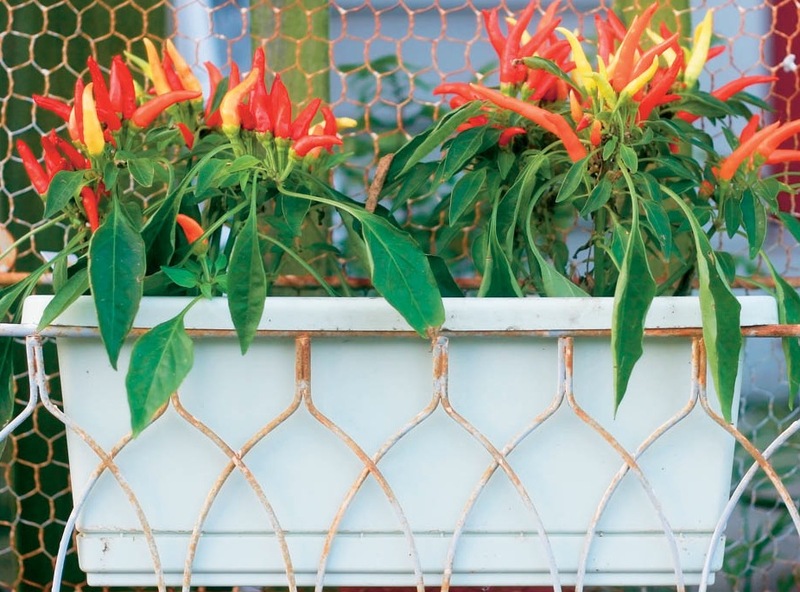 It is rust proof, lightweight and strong and can be styled to look like wrought iron – so a safer alternative for window boxes. You can buy them in recycled materials to make less impact on the environment. Can be bought in recycled materials and recycled after use. Aluminium is soft, so can scratch easily which means even when fairly new, it can look worn. The colour can dull quickly too. You might buy a shiny silver surface, only to be looking at dull grey in a few months’ time! It also has poor insulation which isn’t good for plants. Scratches easily, so can look shabby quite quickly. Silver colour can soon turn a dull grey. Poor insulation can freeze or fry your plants! Wood is a popular choice for containers – especially for window boxes. You can stain, paint or leave it natural; it is affordable – in fact it’s usually the cheapest option; and it is a natural, renewable material – look for containers made from wood sourced from well-managed forests. At the end of their use, wooden window boxes will compost, making them a good environmental choice. 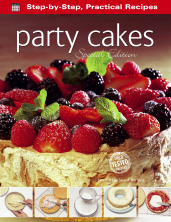 Easy to find and purchase as it is popular. Versatile – can be stained, painted or left natural. Economical choice – you can even make your own. Made from natural and renewable resource. Although it is a common choice, wood will deteriorate over time. It will gradually absorb moisture and wood-loving insects can do damage. In addition, environmental elements such as temperature fluctuations or driving rain can damage the wood. This means wooden containers require ongoing maintenance compared to other materials. Will not last for ever. Can be damaged by adverse weather. Can be damaged by wood-boring insects. This post is based on an extract from our fantastic book, Crops in Pots by Rachelle Strauss (ISBN: 9781783611324) – where you can find further info on growing food in containers. Handy advice on the best crops for pots here. Check out our book, Crops in Pots, for more on achieving the best container-grown harvest! Here's some visual inspiration – how others are growing food in small places. Top image by Richard Masoner and used under license.